Click image to enlarge Point Adams as seen from Clatsop Spit. Saddle Mountain is in the distance. Image taken September 27, 2009. Point Adams lies on the Oregon side of the Columbia River and once defined the southern edge of the mouth of the Columbia River while Cape Disappointment, Washington defined the northern edge. Now to the west is the Clatsop Spit and the South Jetty of the Columbia River, along with Trestle Bay and the Pacific Ocean. To the east of Point Adams is Hammond, Oregon, Tansy Point, the Skipanon River and the community of Warrenton. Further east is Youngs Bay and Astoria, Oregon. Point Adams is the location of Fort Stevens, a military fort dating from the Civil War era. Today Point Adams is located at Columbia River Mile (RM) 7. The name "Adams" was given to this southern Columbia River point by Caption Robert Gray on May 18, 1792, in honor of John Adams, former President of the United States. On May 19, 1792 Captain Gray, in the official log of the Columbia called the point "Adams' Point" while fifth mate John Boit wrote "Point Adams". "... Capt. Grays named this river Columbia's, and the North entrance Cape Hancock, and the South Point Adams. [John Boit, May 18, 1792] ..."
Later in 1792 Captain George Vancouver called it "Point Adams". "... Point Adams, on the south side of the river, is distant from Cape Disappointment nearly 5 miles. It is low and sandy, and has, at its extremity, an Indian village, named Clatsop, which merely consists of a few rough lodges, constucted of boards, or rather hewn planks, of large size; the interior resembled a miserably constructed ship's cabin, with bunks, &c., the only light being admitted from above, near the ridge and gable end. Around the whole is a palisade, made of thick planks and joists, about 15 feet in length, set with one end in the ground, to protect the inhabitants from attack. ... From each point of the entrance of the river a sand-spit runs off nearly 4 miles; that from Point Adams projecting to seaward of the other, begin nearly at right angles to it; the distance between them is nearly one mile. These sand-spits have been formed by the deposits of the sands brought down by the river, or washed by the abrasion of the sea from their respective capes. ..."
The 1858 U.S. Coast Survey "Coast Pilot" describes Point Adams as being low and sandy and "covered with bushes and trees to the line of sand beach and low dunes; and although it is reported to have washed away over half a mile since 1841, we find comparatively small changes since the survey of Broughton in 1792." "... Point Adams is low and sandy, covered with bushes and trees to the line of sand beach and low dunes; and although it is reported to have washed away over half a mile since 1841, we find comparatively small changes since the survey of Broughton in 1792. The geographical position of the triangulation station of the Coast Survey on the point is: Latitude 46 12 30.4 north, Longitude 123 56 55.8 west. ... This station is on the inside of the point, and almost half a mile from it. No light-house exists here, but the necessity for one has been so repeatedly urged that we cannot refrain from calling attention to a few facts bearing upon the question ... This point was called Cape Frondoso by Heceta, who discovered, but did not enter this river in August, 1775; and named Adams' Point by Captain Gray, in 1792. The Indian name of the point is Klaát-sop. It is now called Point Adams. 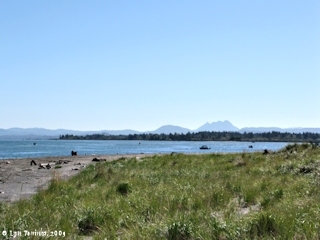 The beach around Point adams and to the southward some distance is usually called Clatsop beach. ..."
"... The southern Point of the Entrance to the Columbia River is Point Adams. It is a low, sandy point, covered with fir and undergrowth to the edge of the sand beach and low dunes. The forest is dense and the trees high so that the point has an appeareance of height and is somewhat readily made out, especially if the atmosphere is hazy inside. Stretching out from Point Adams is the great shoal known as the Clatsop Spit, whose normal direction points towards Cape Disappointment. It frequently stretches more than half way across the mouth of the river, and is then usually marked by the breakers around its whole extent, except in exceedingly smooth weather and at high water. But there have been periods when its northern edge stretched straight out to sea, and then swept in far to the southward of Point Adams. The shortest distance from Point Adams to Cape Disappointment is a little over five miles, and the bearing northwest by west (NW. by W.). The distance from Point Adams Light-house to Cape Disappoingment Light-house is five and seven-eighths miles, and the bearing north fifty-five degrees west (N.55° W.). This point was not named by Heceta. On August 17, 1775, he was off the mouth of the river, which he supposed to be a great bay, but he was so far distant that he noted only the Cape, on the north, and Tillamook Head on the south. It was not distinguished by Cook or by Meares. It was called "Adams' Point" by Gray in 1792; and later in the same year Vancouver named it Point Adams. Lewis and Clarke, 1805-'6, speak of it in their narrative as Point Adams, but on the chart of the entrance to the river it is called Point Round, and on their general chart P. Ronde, the name applied to it by La Pérouse. The name Point Adams was retained by the United States Exploring Expedition in 1841, and it is never known by any other. De Mofras calls it C. Frondoso ou Pte. Adams. The Indian name of the point is Klaát-sop. 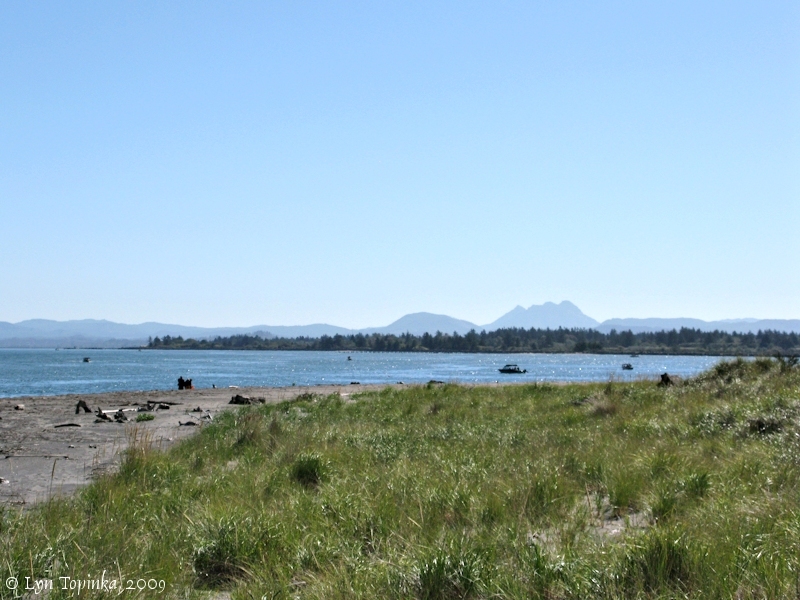 The beach around Point Adams and to the southward for some indefinite distance is locally known as the Clatsop Beach. ..."
"... The old light-tower on Point Adams, on the south point at the entrance, shows fairly well from seaward. The trestle work of the jetty extending seaward from Point Adams is prominent from southward; it shows well when entering by the main channel. ..."
"... Point Adams, the south point at the entrance, is a low sandy point covered with fir and undergrowth to the edge of the sand beach and low dunes. The point usually shows well from seaward, particularly if it is hazy inside. ..."
"... A Coast Guard station is at POINT ADAMS, 5 m., named for Vice President John Adams in 1792 by Capt. Robert Gray. In 1775 Capt. Bruno Heceta observed the point. He named it Cabo Frondoso, which means "Leafy Cape." Though Heceta had reached the Columbia River, he did not realize the fact. ..."
In 1865 Fort Stevens was established on Point Adams, and for the next 84 years it defended the mouth of the Columbia River. The Point Adams Life Saving Station, also known as Life Saving Station #311 and later Coast Guard Station #326, was located at Hammond, Oregon, near Point Adams. The station was established in 1888, built in 1889, and was placed in active service in December 1889. The station began with a crew of eight and by 1900 increased to nine during the summer months. The station was discontinued in 1967, with its search and rescue duties taken over by the Cape Disappointment station. In January of 1967 the Coast Guard decided to close the lifeboat station although one source notes that it may have been closed as early as 1963. Its SAR responsibilities were taken over by the station at Cape Disappointment. The Point Adams Station buildings were then used by the Clatsop Community College before the National Marine Fisheries Service bought the station and surrounding land from the Coast Guard." Source: U.S. Coast Guard website, 2011, "U.S. Coast Guard History Program". A steam powered fog-whistle existed at Point Adams until February 1, 1881, when it was discontinued "because the sound could not be heard far enough seaward in bad weather on account of the terrific noise of the great breakers" (U.S. Coast Survey, 1889). In the late 1800s and early 1900s a fixed red lantern light at "Fort Stevens Wharf Post Light" existed, at 14 feet above mean high water, located on a small dark-brown wooden house. Four lighthouses have been located near the mouth of the Columbia River and two more were located inland. They are the Cape Disappointment Lighthouse (1856), Point Adams Lighthouse (1875), North Head Lighthouse (1898), and the Desdemona Sands Lighthouse (1902), and inland were the Warrior Rock Lighthouse (1888), at the lower mouth of the Willamette River, and the Willamette River Lighthouse (1895), at the upper mouth of the Willamette. The Point Adams Lighthouse was built in 1875, discontinued in 1899, and destroyed in 1912 with the building of the South Jetty. The 1889 U.S. Coast Pilot gives a nice description. "... This is a primary Sea-coast Light. The Light-house is not on the northern extremity of the point, but on the outher one of the low sand ridges which run parallel with the ocean shore-line. It is almost one mile south of the point and two hundred and eighty-five yards inside the high-water mark. The structure is a low, square tower rising from the keeper's dwelling. The buildings are painted white, the lantern and dome black. The buildings show against the dark back-ground of the high fir forest, which is about three hundred yards inside. The present characteristic of the light was given to it on January 21, 1881, when the Tillamook Rock Light was first exhibited. Previous to that date it was a flashing red light. The light shows round the entire horizon, but the compass range useful to mariners is from southeast by south (SE. by S.), through the south and west to north by west half west (N. by W. 1/2 W.), where it is cut off by the trees nearer the extremity of the point. The base of the tower is fifty feet above the mean level of the sea; and the focal plane is ninety-feet above the sea, so that in favorable conditions of the atmosphere the light should be visible from a height of fifteen feet at a distance of about eleven or twelve miles. In summer, during the early part of the evening, dense fogs, which are formed over the waters and low beaches of Gray's Harbor and Shoalwater Bay, are brought southeastward by the summer winds and roll over Cape Disappointment, which they completely shut in before reaching across the river, so that a vessel may make the Light-house on Point Adams when the Cape is invisible. ..."
In 1902 the Desdemona Sands Lighthouse was built near Point Adams. The Desdemona Sands are shoal sands off of Point Adams named after the bark Desdemona who, while inbound to Astoria, grounded there in December 1856. Location: On low sand ridge, 1 mile S. of Point Adams, Oreg. Remarks: This light is obscured by trees on Point Adams when it bears about SE. TIllamook Head, S. by E. 3/4 E., 14 1/2 miles; Cape Disappointment Light, NW. 3/4 W., 5 1/2 miles. There is a life-saving station, inside the Columbia River Jetty, to the eastsward of Point Adams Light-Station. Source: "Lights and Fog Signals of the United States", 1895, Government Printing Office. The SP&S railroad had a station named "Point Adams" which served the Point Adams Coast Guard Station just east of Hammond.